This project has been proudly supported by a grant from Investors Foundation. Learning to breath, to self-calm and to have a positive connection with our bodies begins when we are children. While kids yoga is a luxury for many families, the science behind its benefits in childhood and into adulthood is clear. 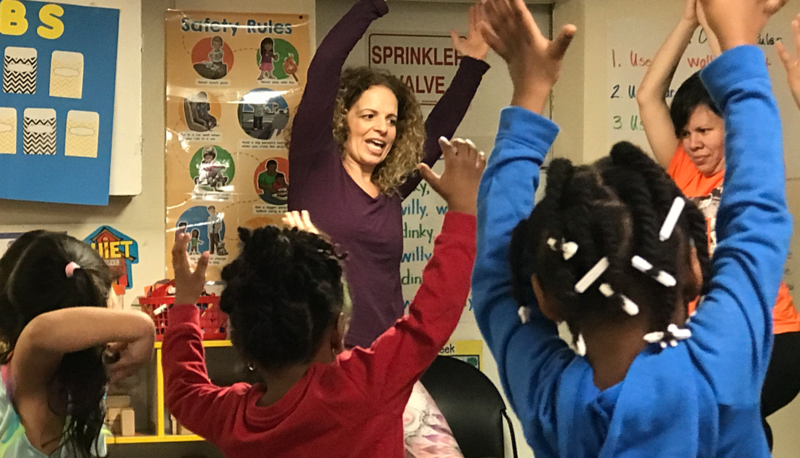 Our teacher, the loving mother of two children herself, shares yoga and meditation with the 3 and 4 year olds receiving free pre-k education at the Head Start in Huntington. All children are precious and are deserving of our attention and love! "Yoga should be available to ALL!! Sharing yoga and meditation with pre schoolers is such a gift!! Introducing these practices at such a young age to such moldable impressionable young ones fills my heart with so much JOY because they will have such amazing tools to tap into as they develop and grow and learn how to navigate and cope with life’s little lessons in such a constructive positive healthy way!!" "L.I. Child and Family Development Services Inc., dba Long Island Head Start, is a private not-for-profit 501(c)(3) organization. Today, Long Island Head Start serves over 2,000 children and their families in over 25 licensed Head Start and Early Head Start centers throughout Suffolk County. In 1999 Long Island Head Start was awarded the first Early Head Start grant on Long Island to provide services to infants/toddlers and pregnant women. This program is now operating at four Early Head Start centers. Head Start consists of the following Content Areas: Education and Early Childhood Development, Disabilities, Mental Health, Child Health, Safety and Nutrition, Parent Involvement, and Family/Community Partnership."